First up was my baking class. I did not get to make cookies, or pie or anything. Instead we were tortured by the 2nd year students baking next door. The smells were amazing. I did however get to follow along with everyone as we were warned of the perils of the giant mixers, procedures, store rooms, honour codes, and keeping your sh*thole clean…according to my old German Chef instructor. He was amazing. My first 15 minutes of fame resulted from either being old, or smart…but I was the only student in class who understood how to measure on a counterbalanced scale, meaning I got to tutor one half of the class while Chef helped the rest. I know it really does not sound like a blast, but it was! really …i swear it was. The second class of the day was Intro to Fine Dining ( Service etc) and Wine ( last 7 weeks). I think I will stick with the under 19 set and smell intently and record other student’s impressions of the wine. Some of you may not know that one of my few claims to fame is that I have never had a drink in my life. It seems pointless to break a streak at this point. There will still be plenty to learn about grapes and regions and blah blah blah…and I am happy to soak it all in. I do have a bloodhound type nose so I should do just fine. When I walked in the door I flaked out for an hour and still woke up with a headache. I resorted to my old favorite drug of choice, Imitrex and all is well. Pizza tonight , using my NEW PIZZA PEEL. When I purchased school supplies yesterday I decided to splurge on the wood pizza peel . I needed to explore the bottom of the oven technique that Jules from Stone Soup recommended. It worked perfectly this time with NO BURNS. For $15 it was money well spent! fried up some onions in one pan and mushrooms in another on high heat. Removed the HOT PIZZA STONE ( 400 Degree preheating) from the oven and placed the rolled out pizza dough on it. Top bottom dough with a bit of EVOO. sprinkle feta cheese on top. Season with pepper and salt if feta is not too salty. squeeze balsamic glaze over the top if desired. 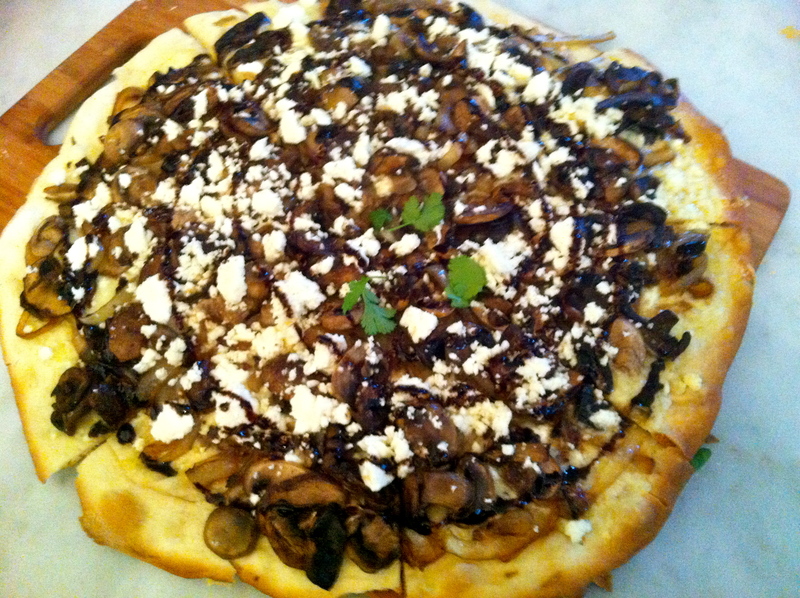 MUSHROOMS are amazing when paired with a blue cheese or brie type as well. Just add on when you remove from the heat. The delicate cheese will melt and not burn off this way. I would like to think so but I flatter myself. He has inspired me for years now. I was delighted to see that my pizza post was right in sync with his NYTimes piece this week. Check out his TED TALK too while you are at it. 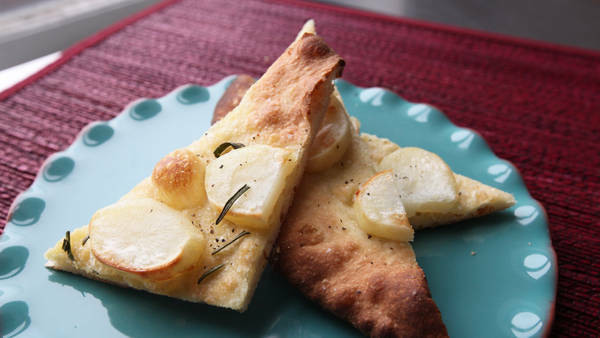 Potato Pizza: Mark Bittman makes a simple pizza with potato and rosemary. I’M here — back in the Dining section with a new column — to insist once again that not only can you cook it at home, but you can likely cook it better. Mark Bittman will host an hourlong chat this Wednesday at 3 p.m. Eastern Daylight Time on The Times’s Facebook page, answering your questions on the ins and outs of making pizza. Mark Bittman’s new column, How to Cook Everything, will appear every other week in the Dining section. He will continue to write for Opinion and the Sunday Magazine. “It,” in this case, is pizza, and the impetus for today’s installment was a visit to a highly acclaimed pizza joint in Manhattan, where I was served (for $15, or about four times the cost of the ingredients in a supermarket) a perfectly ordinary, overly poofy, drearily sauced pizza. Granted, the mozzarella was first rate. Big deal. This followed by a couple of days what has become a not-atypical dinner at my house, where I served a pizza bianca, lightly sprinkled with olive oil, salt and rosemary, and threw together a pie with a tomato sauce based on a slew of onions and a bit of guanciale (only because I happened to have some), along with a sufficient amount of grated Parmesan to make its presence known. I won’t even get into the money-saving part; people who cook at home for economic reasons already know about that. I will say that my crust tasted better, and my pizza was more properly cooked (yes, that’s a matter of taste, but do you really want to eat a bialy with tomato and cheese, as seems to have become de rigueur?) and better sauced than the one I ate a few days later in Midtown. Yours can be, too, and I know that because I’m not really that good at making pizza. In fact, two or three of my close friends do it better, and I know of others. It’s about three things: some confidence, practice and a food processor. This piece is my attempt to instill you with the first, encourage you to get the second and implore you to use the third, though even that’s not necessary, since there is an alternative: the no-knead method popularized by Jim Lahey. I’ve gone back and forth between the two, but for ease, lack of mess and more-flexible timing, I’ve come to prefer the food processor. Still, make the dough however you like, because you won’t go wrong. I love it for pizza because you can make the dough in five minutes. (A video of this is here.) Although rushing isn’t ideal, you can start pressing or rolling out the pizza 20 minutes later. (Use the larger amount of yeast if you’re doing this.) Which means, in a pinch, start to finish in an hour. What is ideal is letting the dough rest for a while in the refrigerator or even freezer, though for best quality not for more than a few days. The advantages of this technique, besides the obvious convenience (make the dough in the morning or up to a few days before, and just let it come to room temperature before proceeding), is that the dough matures, marginally improving its flavor and making it considerably easier to handle. There are, of course, some fine points, but even here there’s flexibility. Should you roll the dough or pat it out? That’s your call. (If you pat it out, you can leave it thick and dimpled — use your fingertips — and call it focaccia.) Should you use a pizza peel and a stone? Well, yes, and if you preheat the stone for a good half-hour, the crust will crackle even more, but it isn’t essential. I didn’t have a peel for a couple of years (no room) and used a piece of plywood or a flexible cutting board. And if you don’t have a stone, a baking or cookie sheet will do fine; just use a little olive oil to keep the dough from sticking. This will give you a crisper crust, one sort of halfway to the fried dough Pete Wells writes about this week. A whole-wheat crust? Sure, 50 percent; it won’t be as crisp or have the same “pull,” but it will have a deeper flavor and give you a warm, fuzzy feeling. (You can also integrate herbs, garlic, dried chiles, loads of black pepper, cornmeal, whatever, into the crust; the food processor makes this incredibly easy.) Extra-crisp crust with extra-moist topping? Prebake the crust about halfway, with just a bit of olive oil on top, then add everything else and return to the oven. Mix the dough by hand? Yes, but you’re increasing your workload or, if you go for the no-knead method, your time. If your food processor isn’t big or powerful enough for the recipe here, halve the recipe or get a new food processor. Other uses for the dough? Fried pizza or calzone, both discussed elsewhere in this section; rolls or bread or even those silly garlic knots. But pizza is the highest and best use. The options don’t stop, and we haven’t even started on toppings. When it comes to these, I’m pretty conservative, favoring the kind of treatments I mentioned earlier, or pizza with potatoes (a legitimate Roman favorite, obviously for carb lovers), eggplant or zucchini. Others include the obvious, like tomato sauce of almost any type, with or without mozzarella and/or Parmesan; fresh tomatoes; pepperoni; anchovies; sausage (cooked or crumbled); chorizo or other cured meat; olives; onion cooked to any degree or not at all, with olive oil; pesto (or fresh basil); eggplant or zucchini, sautéed or grilled first, with or without cheese and/or tomatoes; seafood (raw clams, oysters, shrimp, scallops, lightly steamed mussels, lobster, whatever), preferably with garlic, oregano and oil. I don’t wander far from those, which doesn’t mean you can’t. It’s all optional, and all good. Better, in fact. A version of this article appeared in print on April 18, 2012, on page D1 of the New York edition with the headline: For Chefs at Home, A Pie Above the Rest.